This fresh salad bar will become your new favorite. My introduction to Sweetgreen was in Philly, near the Penn campus. I really enjoyed this salad bar when I was there, so when I heard that the fast casual restaurant had come to Chicago’s River North neighborhood, I had to give it a try. If this place doesn't make you like salad, nothing will. The inside was minimalist, sleek, and hip. The music playing was excellent, not to mention there was already a line forming at 11 AM on a Saturday. After perusing the menu, I opted for the Hummus Tahina and my friend opted for the seasonal Portobello Taco Bowl. Our salad ingredients were scooped into a tin bowl and tossed. After checking out, we sat down. Sweetgreen is notorious for nailing its flavor combos every time, and this salad was no exception. The vinaigrette dressing was full-bodied but not too dense. I do recommend getting light dressing though; the flavor might be too overpowering otherwise. The salad was warm, which was great for the brisk day. The sweet potatoes were fresh and not too mushy, but the tortilla chips were not very crunchy and kind of soggy. Overall, though, this bowl came together with fresh ingredients that complemented one another. My salad was truly a standout dish. The middle eastern flavors worked extremely well together. The Tahini dressing packed a satisfying punch; I got medium quantity dressing, which I stand by. From the kale to the cucumber, everything tasted extremely fresh, particularly the tomatoes. If you like Mediterranean food, you can’t miss this. If you like Mediterranean food but don’t think you like salad, let this creation rock your world. 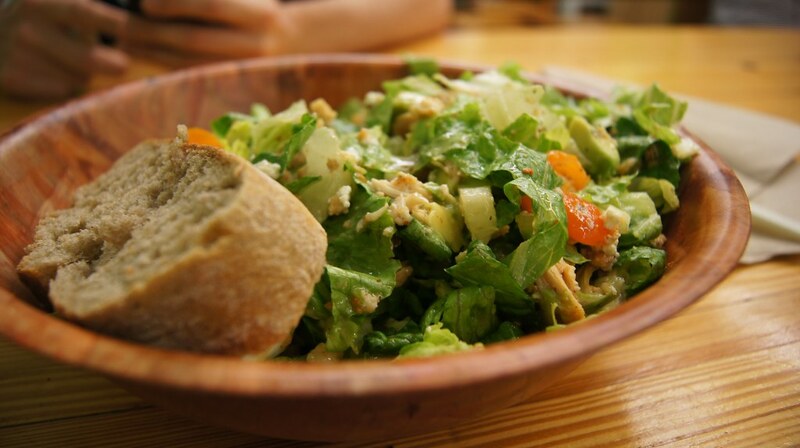 Both our salads came with sourdough bread, which was fresh, flavorful, and had great texture. Overall, Sweetgreen is a great addition to Chicago, with fresh ingredients, excellent flavors, and good vibes.